(PRLEAP.COM) Long Island, NY August 27, 2013 – Elizabeth Holmes is one of 25 design professionals renovating Cedar Knolls, a true Gold Coast mansion located in Laurel Hollow, New York, which opens August 31st. The 23-room Georgian style estate was designed by Noel and Miller in 1929 and built by railroad tycoon Jay Gould in 1930. Holmes set out to create an evocative and sophisticated space with lacquered surfaces and luxe materials. "I thought about what inspires me as a designer, and if I had the opportunity to cultivate this space, what would it say, and more importantly, what would it wear," said Holmes. "I began compiling reference images, as I often do from fashion magazines, and then recalled my visit to the Savage Beauty exhibit at the Metropolitan Museum of Art in 2011. I was moved by the artistry, talent, and tailoring of Alexander McQueen, and wanted to curate a sense of drama much like he did with his garments." Holmes draws inspiration, not only from fashion, but also from the room's architectural elements and geometry. "When I walked into that space, I was struck by the arch of one window and the hexagonal shape of another, so geometry and lines informed many of my design choices – from the diamond-patterned wallpaper and window treatments to a circular multi-tiered brass table and stacked wooden sculpture." 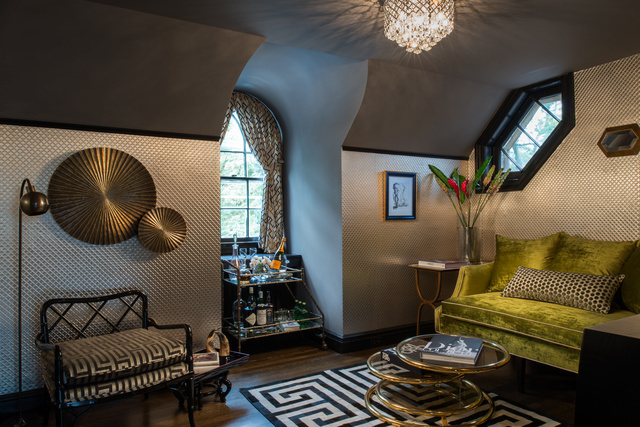 Elizabeth Holmes is a residential interior designer providing full service interior design services in New York. Services include paint color selection, home décor shopping, and home and model apartment staging. For more information about Elizabeth Holmes Design, visit www.elizabethholmesdesign.com. Design Show House Cedar Knolls is located at 1450 Ridge Road in Laurel Hollow, New York and is open to the public beginning August 31 through October 20, 2013. Shuttle service to tour Cedar Knolls is available on select days from the Harbor Mist Restaurant, located at 105 Harbor Road in Cold Spring Harbor, NY. For more information, visit http://www.facebook.com/DesignShowHouseCedarKnolls.